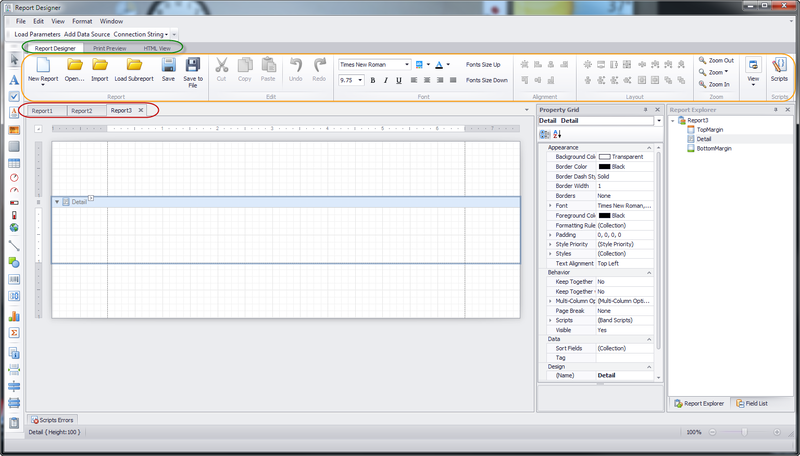 The window can be interactive using the scripts you design in the report designer. There are numerous possibilities here. Drilldown reports, menus, etc. This can be your user interface to the reports you want to give to a user. Users don’t even have to see the functions of Sunset Reports to see the reports they want or you want to give them. You can launch other reports in Window View or Print Preview. The window is automatically sized to the page size of the report design so you can control the window size. Make it as small or large as you want. Include any of the report objects. Use a Label with a OnClick script to create a button. You can set a time for the window to refresh. This means your report will be updated periodically automatically. The update time can be as little as 1 second. So now your report will update in real time showing real time data. If your report has more than one page, and if you set an window refresh time, the pages of the report will cycle to that time, and when the first page comes back up, the report will be refreshed with new data. This feature can be used for slide shows with real time data. The following figure shows a Window View of a report design. This design is intended to work as a menu system. It has a clock that is updated every second. The five items on the right are labels with click events to perform functions. This example is included in the sample reports file included with the product. You can actually create your own application with this feature. This version focuses on the look and feel aspects of the product. The changes made to the various list forms including grouping, sorting, filtering, column selection, etc. will be saved and restored the next time the form is opened. This includes the data source list, report design list, report definition list, report list, and queue list. Start the program with “opening arguments”. Create your own shortcuts or even open Sunset Reports with another program. Up to 4 opening arguments will put the software in one of 8 modes. A new menu interface inspired by the Windows 8 Metro interface. Now it will be easier to use our software with your touch screens. Normal mode connecting to arg1 instead of the default user report storage file. With Arg2 = a Report Definition Name and if no Arg3 then print preview the report definition by that name. Here is the new menu…. 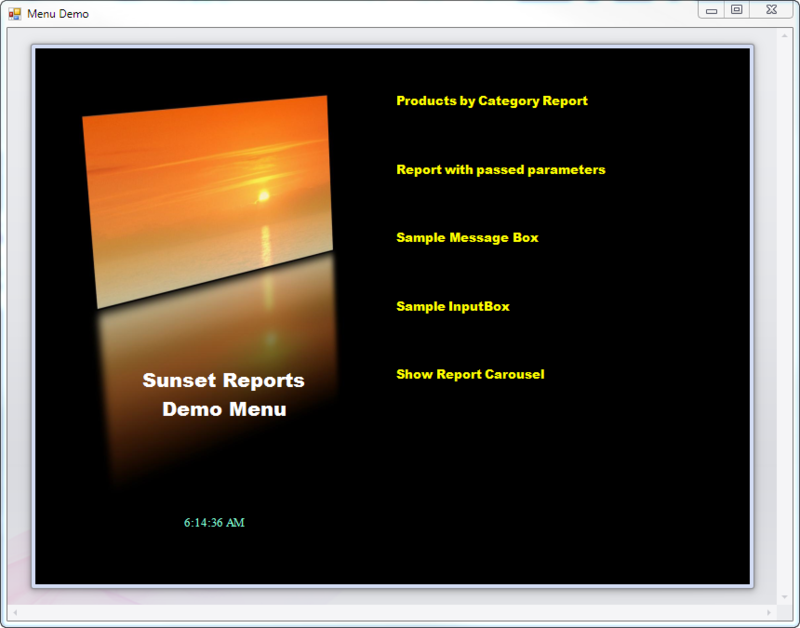 If you are an existing Sunset Reports customer, upgrade to this version for FREE! These special formats are used for report bursting which is also referred to as report splitting or report exploding. They are also useful for email blasts or email broadcasting. PDF Page Burst: If you select this format, a single report will be broken up into multiple files, each file containing one page. The filename will be the report definition name followed by a dash and the page number. PDF Bookmark Burst: The PDF Bookmark Burst is a little more tricky than the simple page burst. This format requires that you include a label control in your report design named exactly “BurstFileName”. This control’s bookmark property needs to be bound to a data source that will determine the name of the file. A good example of this might be invoice number, customer name, or a combination of similar items. It wants to be something that will uniquely name the file and give you a description of what the file is. So as an example, you could end up with a folder full of PDF files for your invoices. When you preview the report, all the invoices will be in one report, but when the report is processed from the queue, it is separated into multiple files. Exactly which pages of the big report go into which files is controlled by the placement of the control in the report design. The best place to put it is in a group band, and then you set the group to start on a new page. This insures that pages are separated properly for each report file. There is also another twist to this format. If you also include a control name exactly “BurstEmailAddress” and bind the value of that control to your data source that contains email addresses, the reports will be created as separate files, but also emailed as attachements. The subject and body of the email is controlled by the specific queue entry. With this powerful feature, you can now send out multiple emails with different attachments with a single report and queue entry. MHT Bookmark Burst: This format is a variation of the PDF Bookmark Burst, except for the following. The report format for the separate files is not a PDF, but instead an MHT file. This is a referred to as a MIME HTML file where the page format combines what might be multiple files for HTML. If you include the control named “BurstEmailAddress” as described in the PDF Bookmark Burst section, then the report will become the body of the email instead of the attachment. This is perfect for email blasts or email broadcasting. Graphics will work and the email is sent with the body as HTML. 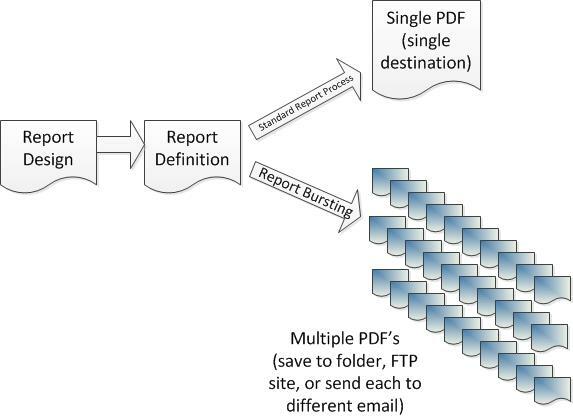 The concept is to print one report definition and have multiple report files like PDF’s creating with individual files for multiple recipients. For example, you have a report definition for invoices to send to all your customers, but you obviously want to send just one invoice to each customer. With standard report processing, you will end up with multiple invoices in one big PDF. With Report Bursting (also referred to as report splitting or report exploding), you can have a single file for each customer/invoice. Each file is a subset of the report results. This new feature is in the works with our development team and testing is in progress. And with our report distribution system, each report can go to a different email address too. This new feature will be valuable for order confirmations, invoices, contracts, purchase orders, dunning letters, employee statements, billing statements, promotional mailing, sales letters, appointment confirmations, etc. or any report you design. The developers at Sunset Reports are working on yet another version of Sunset Reports adding new features to make the product the best in its class. One of the new features is a new report designer. In the past versions, you were able to edit one report design in the report designer. Of course, you could have any number of report design windows open so editing multiple reports at the same time was never a problem. Now you can choose between a single report designer or the new multi tabbed report designer. 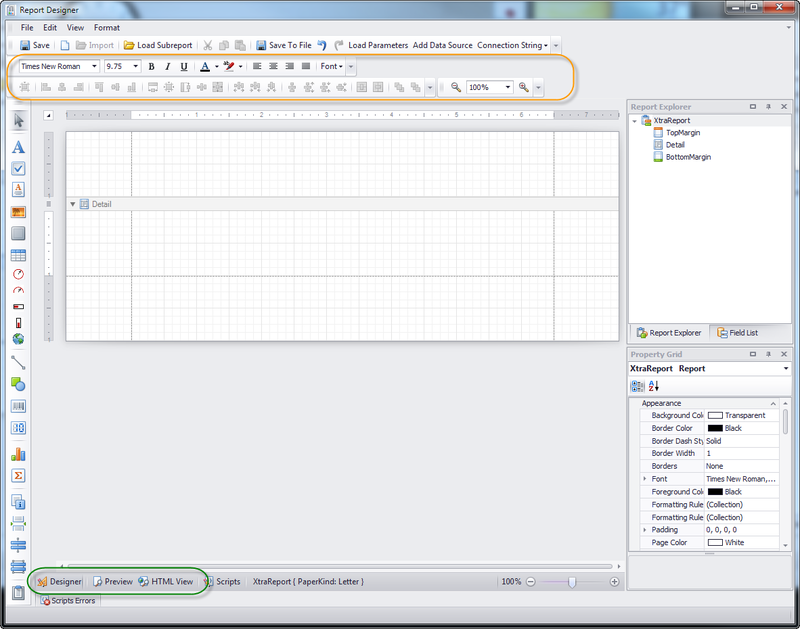 The new multi report designer also has a ribbon bar instead of the standard toolbars. Both designers can accomplish the same task. It is simply the user’s choice as to which one to use. This can be controlled with a new setting on the preferences form. 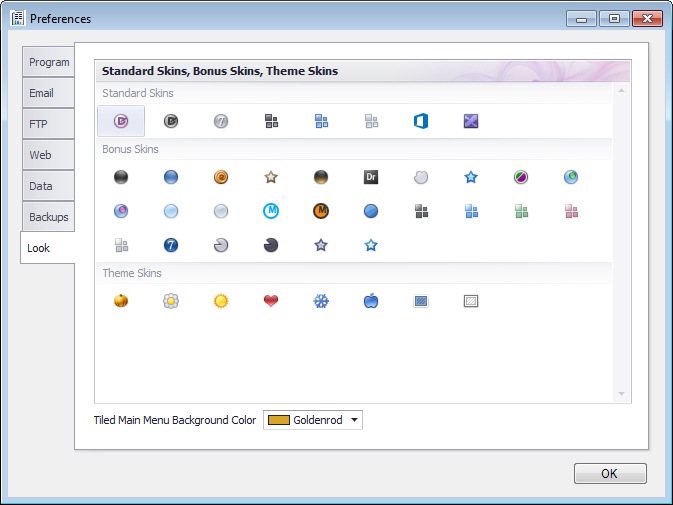 The Single Report Designer with standard toolbars. This version includes a new “Map Control”. More posts will be available to describe this new feature. The User Manual has been updated. All current Sunset Reports customers get this update FREE.